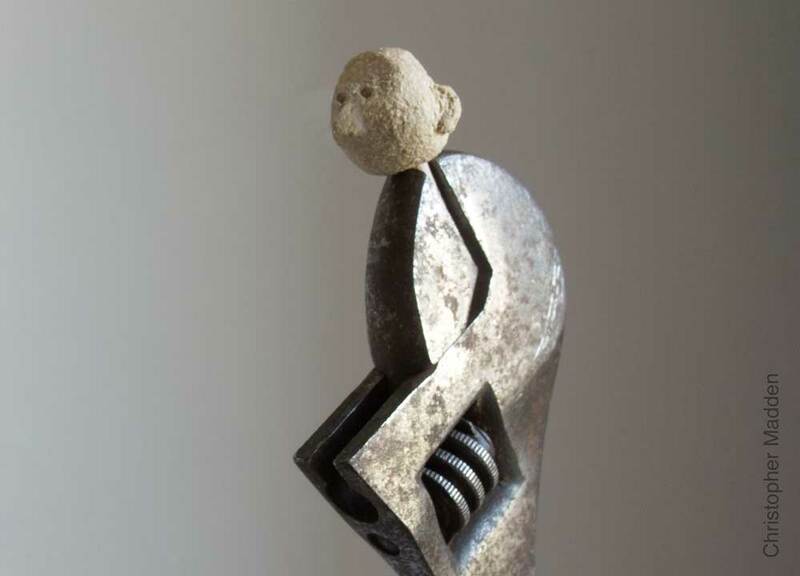 The ceramic head in this sculpture is held in the jaws of the spanner by a thin wooden rod that forms the head’s neck. It is uncertain whether the head is trapped in the jaws of the spanner or whether the head and the spanner form a single entity, with the spanner as the body (The shape of the spanner suggests a seated or crouching body). 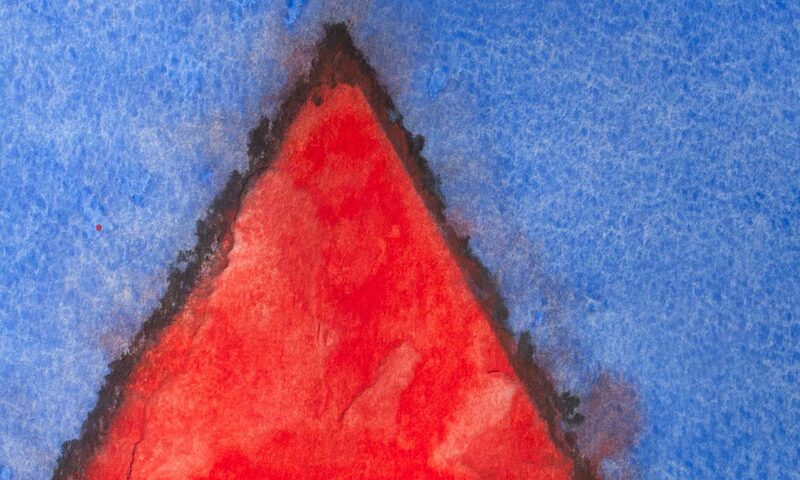 This tension is part of the appeal of the piece. 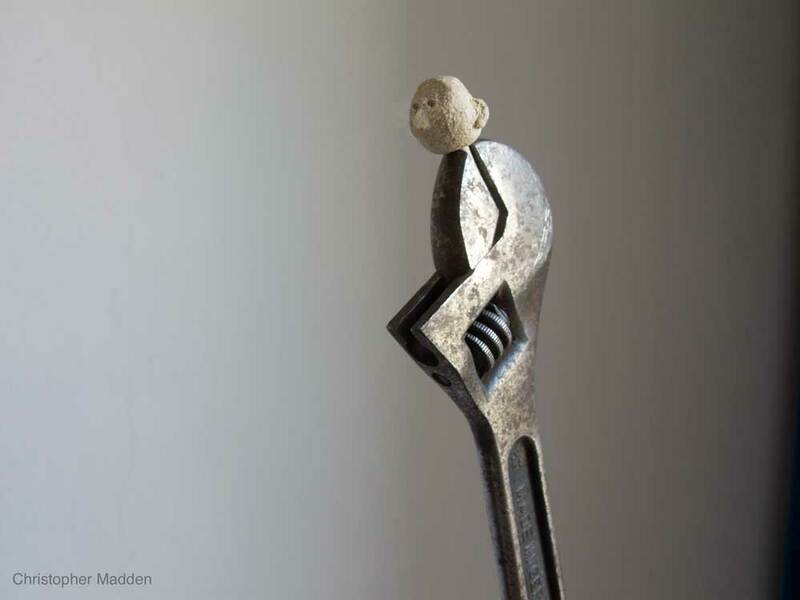 Workshop tools such as spanners and hammers are a recurring feature of my sculptural work. A study in the perception and interpretation of ambiguous visual stimuli. A coloured rod reflected in a mirror so that the reflection of the rod coincides with a differently coloured rod on the other side of the mirror, creating an ambiguous optical effect. 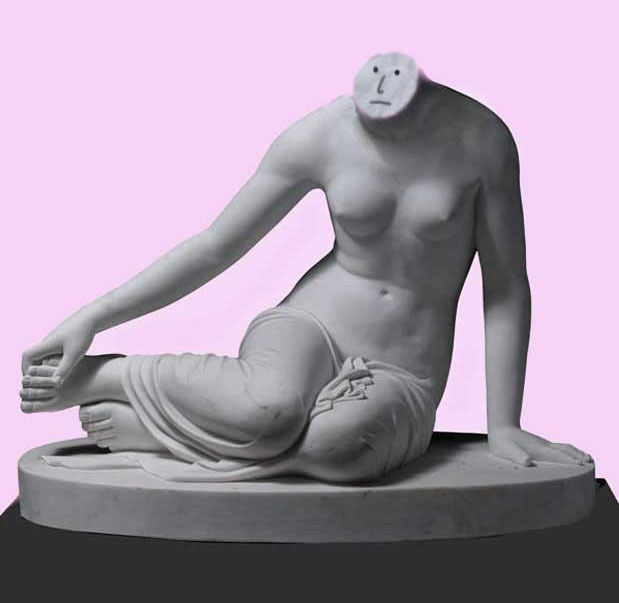 A humorous work consisting of a headless classical statue with a cartoon-like face drawn onto the oval form of the neck. Part of the humor of this piece is the juxtaposition of opposites – the elegant and timeless form of the classical statue in contrast to the crudeness and immediacy of the contemporary head. The piece also contains dark humour and an unsettling quality due to the fact that the drawn two dimensional head is occupying the surface created by the decapitation of the statue’s three dimensional head. The drawn on face also has the appearance of graffiti, so it could be said that the act of giving the statue a face is in fact defacing the statue. The word deface literally means to remove the face (as occurred with the vandalisation of statues in the past), so the fact that the act of adding a face to a statue can be interpreted as defacing the statue is ironic. The Oppressor Impaled by the Oppressed. June 2015. Hammer, nails, plank. 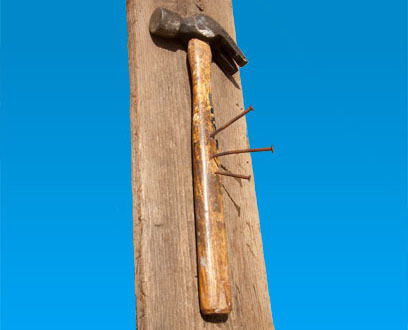 A sculptural piece consisting of a hammer nailed to a plank of wood. Part of the concept behind the work is that the hammer is being empaled by the objects that it normally hits. This is partly a metaphor for oppression and rebellion, and it’s also a study in irony. How did the nails come to be impaling the hammer? Were the nails hammered into place by another hammer? In this case the nails are not the downtrodden oppressed rising up to overthrow their oppressor using their own power, but are more like the followers of another power (another hammer) that may turn out to be as oppressive as the hammer that’s been overthrown. Other versions of this piece have the hammer on a horizontal surface, such as on the top of a plinth. Other versions use different numbers of nails. The vertical version shown here is in some ways more disturbing than the horizontal ones, as the vertical format gives more of an impression of the hammer being violently empaled rather than simply nailed down. It is also disturbingly suggestive of a crucifixion in Christian iconography. An abstract moving image work from a series in which multiple copies of a single shape move and interact using simple computer algorithms, creating complex shapes. In this work 28 disks follow circular paths. Where even numbers of disks overlap they present white, while where odd numbers of disks overlap they present black. To see higher resolution videos and more information about this series click here. 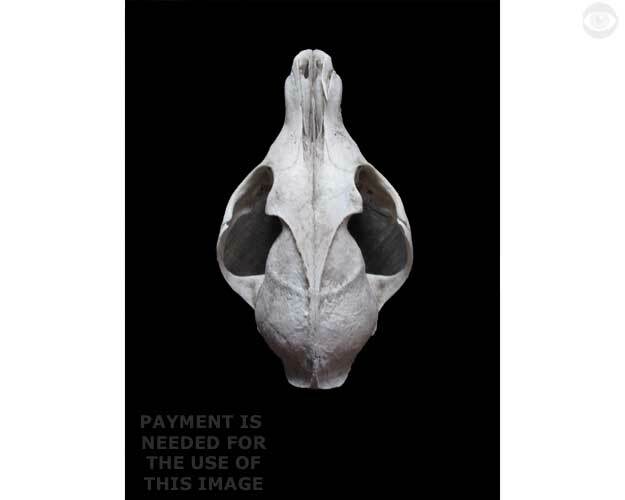 Here’s a photo of a fox’s skull that I took recently. Nice abstract sculptural quality I think. I expect the fox would be very pleased to know that its head had been put to such worthwhile use. Like most of my images on this site, if you want to use the image please contact me, as the images can’t be used without payment. Thanks. For a long time I’ve been interested in the way that the landscape is transformed by the effects of sunshine and shadows, and by the way that we often hardly notice the extent of the difference between the two (other than by a general feeling of pleasure when the sun brightens things up – here in cloudy Britain anyway). The scene filmed here in the grounds of Hatfield House, Hertfordshire, hopefully captures some of the transformational effect of sun and shadow as the sun emerges from behind a cloud (and then goes in again). The various people in the background add a surreal air to the whole scene. 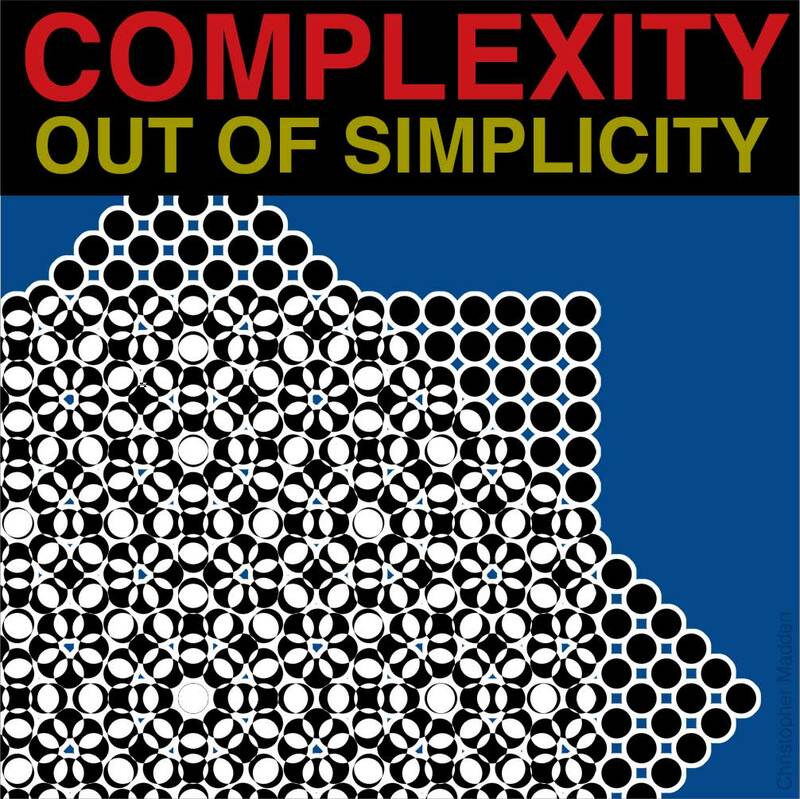 This is a design to accompany a series of video animations that explore the creation of complex forms from simple forms (usually in the form of grids). The works were first conceived as a device to visualise the creation of the complex structure that underlies the physical universe from extremely simple fundamental components. Very much an example of art meets science. A fire made of green wood. The wood at the centre of the fire has been consumed by the intense heat of the fire. 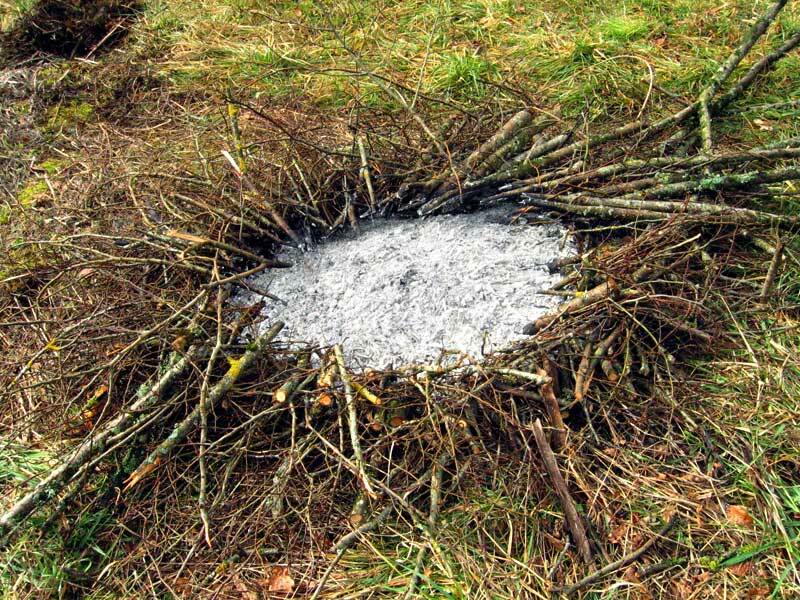 The wood at the edges of the fire remain unburnt, forming an almost perfect ring of twigs and small branches around the ash core.